Local Engineering Mentor Honor in D.C. ACE Mentor Program works with San Diego high school students in pursuing careers in engineering, construction and architecture. Lianne Bell (center) received an award for her years of mentoring San Diego students in Washington D.C. on Monday. A local mentor was honored in Washington D.C. this week. 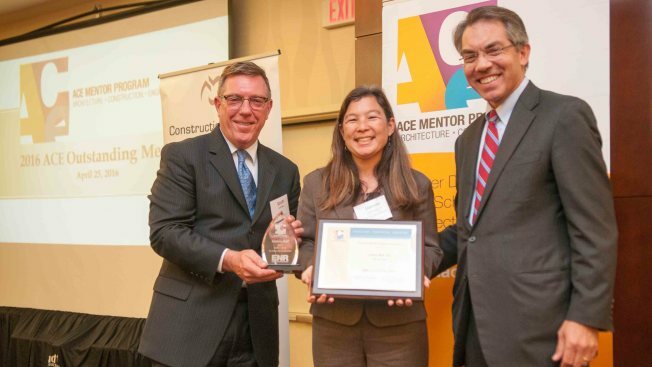 Lianne Bell, a San Diego structural engineer and project manager at KPFF Consulting Engineers, was one of six mentors in the country to receive the 2016 Engineering News-Record-ACE Outstanding Mentors Award on Monday. Bell received the honor as a result of her influential mentoring of high school students by encouraging them to pursue higher education and careers in engineering, construction or architecture. She mentors through the San Diego section of ACE Mentor Program of America. To learn more about ACE Mentor Program in San Diego, click here.